This is the story of Bob Hathaway in a career crisis; of Bob’s boss, the dictatorial Blaylock, trying to force him to do something against his will; of Josh Crater and his struggle to connect with his teenage daughter; and it is the story of a wonderful wise man, Doc Crater, who shows you HOW to connect with others, but first guides you to connect with yourself, because that is the Great Connection. Burger King founder James McLamore was asked the secret of success. He answered, “Total belief in yourself!” But wait! How can you believe in yourself if you don’t know who you are? This is why The Great Connection is enjoying international success. It tells you … in a simple story … who you are, so you can believe in yourself. 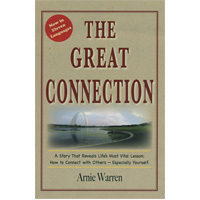 Clearly, The Great Connection delivers its powerful promise. This is the story of Bob Hathaway in a career crisis; of Bob’s boss, the dictatorial Blaylock, trying to force him to do something against his will; of Josh Crater and his struggle to connect with his teenage daughter; and it is the story of a wonderful wise man, Doc Crater, who shows you HOW to connect with others, but first guides you to connect with yourself, because that is the Great Connection.